When Alexander marched on Egypt, the Egyptians had no reason to fear that this would be the beginning of the end of their status as an independent nation. Alexander promised to liberate them, and they put their full trust in him. Their shared hostility to the Persians bound them together; Alexander’s army had just defeated the Persian army in Asia, and Egypt’s patience was being sorely tried by a second occupation. Moreover, the Egyptians did not need to be reminded that when Athens was fighting its own weary wars with Sparta, the Greeks had despatched a fleet of two hundred ships (all lost) to help Egypt revolt against their shared long-time enemy. A common antagonist breeds understanding, and the welcome of Alexander was genuine. The Egyptians did indeed regard him as a deliverer. What they may have failed to realise was that, with the single exception of Egypt, Persian power had been suppressed and that Alexander, who had already made himself master of the disunited Greek world, planned to join Egypt to his already widely extended empire. Alexander made his way to thickly-populated Memphis. There he made an offering at the shrine of the sacred Apis bull - a gesture much appreciated by the Egyptians. Then he lost no time in travelling to Siwa Oasis to consult the famous oracle of Amon-Ra. When he emerged from the sacred sanctuary, he announced that the statue of the god had, by inclination of the head, indicated his acceptance of leadership. He was forthwith hailed by the priests as the ‘son of Amon’. Before he left Egypt, Alexander laid down the basic plans for its government. In the important provinces he appointed local governors from among Egyptian nobles. He made provision for the collection of taxes under his financial superintendent, and he established a small standing army under his general Ptolemy. He also laid out the plans for his great city and seaport, Alexandria, so situated as to facilitate the flow of Egypt’s surplus resources to the archipelago and also to intercept all trade with Africa and Asia. When Alexander met his untimely death of a fever at Babylon, the great Macedonian Empire declined. Egypt was held by Ptolemy, who gradually took over leadership, first as Satrap, then Governor and, finally, in 305 BC, as King. During the three centuries of the Ptolemaic Period that followed, Egypt became once more the most prosperous, rich and powerful state in the world. The Ptolemies played a dual role in Egypt. They conducted themselves as both Greeks and as pharaohs. The two were separate and polarised roles. As Greeks they resided in Alexandria, a predominantly Greek capital, where there was a Greek senate, gymnasium, and amphitheatre. The Museum and Library were planned on Athenian models, and youngsters were raised on a literary diet of Homer and the Greek classics. The Ptolemies were astute businessmen, and their aim was, of course, mastery of the Mediterranean world. Their fleet was manned by Greek mercenary troops, who were accommodated on large tracts of land reclaimed in the Fayoum, a fertile depression south of the apex of the Delta. The Ptolemies saw themselves as landowrners and Egypt as a mighty farm. The Greek states, however, had had no organisation like that of Egypt for the assessment and collection of taxes, and the Ptolemies were quick to realize the benefits of leaving to trained Egyptians the task that they had carried on for thousands of years. In order to do this they reorganised the old Egyptian divisions of the country into different provinces, called ‘nomes’, under a governor, whom they designated ‘nomarch’. To please the Egyptians further and show that they were governed, not by foreigners, but by kings more traditional even than the ancient pharaohs themselves, the Ptolemies decided to conciliate the priesthoods throughout the country. Herein lay the second role of the Ptolemaic kings: that of legitimate pharaohs. 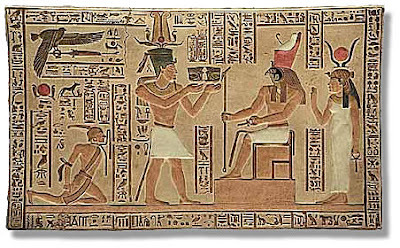 As ‘heirs’ of the ancient kings of Egypt, they lavished revenues on some of the priesthoods for the upkeep of temples or exempted them from taxes. Then, like the ancient pharaohs, they assumed religious office and journeyed up the Nile to make offerings at these temples. Thus giving prestige to the local priests and entrusting nomarchs with the task of tax collection and control of revenue, they acquired the loyalty and devotion of the Egyptian people. Of course, public worship of political leadership was a feature of the central religious organisation that had long existed in Egypt, and the Ptolemies were ready to accept symbolic acts of homage, if it pleased the local population. Local artisans tackled the task of temple construction and reconstruction with vigour. The temples were built on Egyptian plans and decorated by Egyptian craftsmen, depicting the Ptolemaic kings on the walls in the manner of the ancient pharaohs; they were duly inscribed w ith pharaonic titles and ranks in the symbolic language of which the Ptolemies themselves had no knowledge. Rare are the representations of them dressed in Greek robes and not as Egyptian pharaohs. Some of the most beautiful temples in the Nile valley date from the Ptolemaic period. Such monuments as those found at Dendera, Edfu, Kom Ombo and on the island of Philae are dignified though ornate. 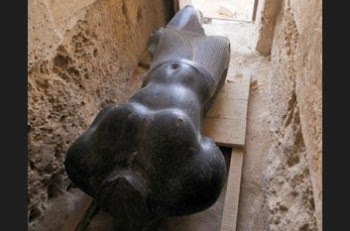 They show fine architectural proportions, although the figures and inscriptions themselves do not compare with the masterly executions from the tombs of the Old Kingdom at Sakkara or the temples of the New Kingdom. It is worthy of note, however, that the sites chosen by the Ptolemies were for their strategic position as well as for the ancient tradition. 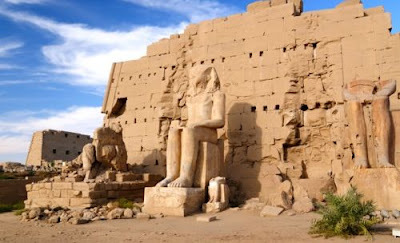 Edfu, for example, was an ancient depot for caravans from Kharga Oasis to the west and from the Red Sea coast. 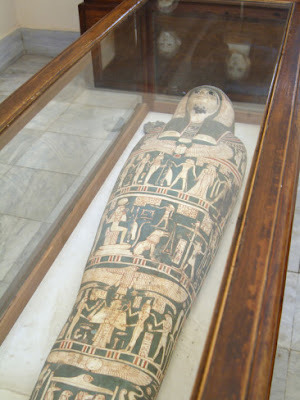 Esna had been a centre for local commerce from earliest times. Kom Ombo, situated on a hill, commanded the trade routes to Nubia, and the temples on the Nubian frontier (Philae, Kalabsha, Debod, Taffa and Dendur) were clearly of strategic importance. Each was a focus of commerce. Thus, we have Alexandria, a Greek capital, which became the seat of learning where the framers of science, philosophy, poetry and art flocked. On the other hand we have the marvellous fertile land of Egypt, with nomarchs facilitating the collection of taxes in order to fulfill the economic needs of the Greek capital. It is significant that, apart from a small number of priestly literates, Egyptian citizenship was not encouraged at Alexandria. 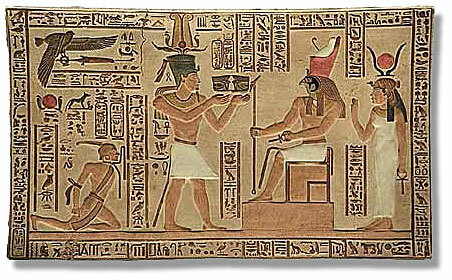 But neither, it should be noted, were Egyptians ever slaves in the Ptolemaic court. Slaves were usually Asiatic.